It’s a tradition for Parisian children and a must-do for young visitors to the city. Rent a petit bateau (small boat) in the ponds at the Tuileries or Luxembourg gardens and while away the afternoon with some good old-fashioned unplugged nautical fun. Sailing a petit bateau in Paris park. For about 2 euros per half hour, your child is given a numbered sailboat and a poking stick to help launch the wooden vessel in the water. Then the whims of the wind takes it on a voyage under your little admiral’s watchful pursuit. When the boat approaches the edge of the circular basin, your child must meet it and prod it with the stick to send it off in another direction. My girls were enchanted by the experience, so focused and engaged with the responsibility of this adventure on the high seas. It wasn’t all smooth sailing, though. My youngest got frustrated when her ship hit the doldrums and didn’t visit the shore as much as her sister’s did (must it always be a competition with siblings?). However, she got her comeuppance when her sister’s boat got entangled in the sails of another and limped along in circles until we could eventually pry them apart. At least my girls didn’t take a nosedive into the slimy pond like that poor little fella we saw one afternoon. Keep an eye on your little ones as it’s quite easy for them to overreach and lose their balance! The basin at the Jardin du Luxembourg is larger than the one at the Jardin des Tuileries. 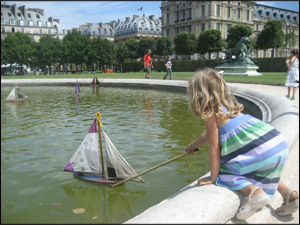 My girls got a bit impatient waiting for the winds bring their ships to shore there, whereas the smaller pond at the Tuileries offered them much more opportunity to interact with their boats. These petits bateaux are such a simple concept, you wonder why this activity isn`t offered in parks all around the world. Then again, this is one of the many distinctive things that make Paris so special. That pond does look slimy. Wouldn’t like to be the one who has to go in and retrieve sunken vessels. I’d totally forgotten about this! Two kids, a baguette with cheese, some grapes and hours of endless fun. (Unfortunately I don’t have any photos since this was in my pre-blogging days). But thanks for reminding me of good memories. My daughter would LOVE this! Thanks for the enjoyable post. Loved seeing this when we were in Paris on our honeymoon. Would like to go back there with my son so he can experience it! We missed seeing this in Paris, probably because we were there a little later in the fall. Looks like fun for kids, though.